Happy Wednesday. This weeks roundup is about style. This boyfriend blazer adds just the right among of structure but not fitted. Love it. The Dior sunnies in their sleek silver and pale pink is a show stopper. 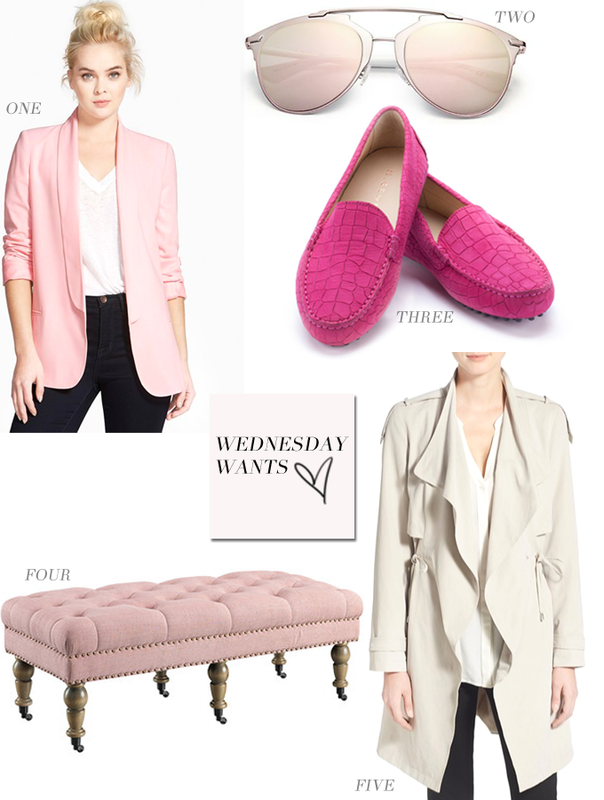 I am glad pink drivers are back in stock with M Gemi and these croc embossed are a must for me. I mean a girl can never have too many pairs of pink shoes right? This bedroom bench is adorable. The center leg adds extra support and the tufting and trim? nice! It's on major sale right now and depending on the color you choose it is even a bigger sale! Bringing up the rear is by no means a slouch... unless of course you are referring to the structure. This slouchy trench would be perfect on those rainy days when all you want to do is get from your car to the building without looking like a stuffed sausage in a buttoned up coat. Rainy season will be here before you know it and you will be happy to have your new trench ready to go. Can't wait to see what next weeks favorite are.